Long time ago I had a file on my computer broadly titled Heavy Metal, in which I included all of the albums I intended to listen to someday seeing that they got positive press in the printed publications and zines whose opinions I respect. That was a long time ago, before a couple of kids and busy work style took over completely. On a rough estimate 90% of that list remains not redeemed. Interesting then how it all comes full circle now that I am reviewing the latest album from Brave, a Virginia band which previously made the aforementioned list under their earlier moniker Arise from Thorns, the band I never got to hear. Landing in my register next to Rain Fell Within and Autumn Tears, I was rather interested at the time in the atmospheric metal perpetuated by the Massachusetts label Dark Symphonies, but Arise from Thorns time never came. 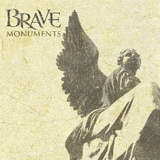 It is ironic then that Brave now emerged for me, almost totally shedding off the ephemeral atmospheric sound, instead inhabiting the realm of radio friendly female fronted progressive rock/metal hybrid. Although probably quite closer to mainstream than underground, I see nothing wrong with the aforementioned style, if done right, and Monuments is done very well. Song oriented, and often bearing a female point of view via its lyrics, the songs on the album sit atop hefty crunchy guitar riffs, with the jazzy complex rhythmic foundation not letting it slip into mindless groove (Hold On, Hero). Even though some songs are more obvious attempts at radio hits (Forgiveness), Sooner or Later gets that heaviness back, even with slight distortions added to front lady Michelle Loose’s voice. Dynamic instrumental To Remain Unseen explains further that Brave is in it not for the chance to cash in on the obvious playing skills, but because they have a view point to share. Songs on Monuments present different moods, from soft and atmospheric pair of Sleepless and Without You to up tempo rocking Driven and droning more experimental closer Stronger. Michelle Loose will not be confused with divas from Lacuna Coil or Nightwish, but she sounds crystal clear, hitting all of the notes in the production which makes her a showcase. Another interesting aspect of the band is Suvo Sur’s violin, which adds depth to the songs, adding a Celtic or Scandinavian angle, sometimes reminding me of the sound of Green Carnation on Acoustic Verses (which is a damn good thing). Brave band members, guitarist Scott Loose and drummer Trevor Schrotz, contribute to one of melodic traditional doom bands I am really into, While Heaven Wept, and that scores them additional points with me. Nevertheless, going for the more commercial and established sound, Brave did not lose that personal, emotionally involved and sentimental feeling which makes it endearing. This band would sound just as well in the 30-seat coffee house near you as it would while receiving extensive radio play. I have this stupid habit which I call “underground syndrome”. Somehow I always become less interested in the band after, deservedly, it jumps from the ranks of the unsigned to the better known status and, all of a sudden, I am not the only one aware of the artists. I have to promise it to myself with Brave not to fall into such trap, as I can clearly see this outfit going places if the right label decides to scoop them up.